After ten hours of sleep, we awoke this morning feeling particularly energized and ready to find our way around this city. Sitting on the porch at around 8 a.m., we began sweating — while the temperature here is only in the low 90s, the humidity so deep in the jungle is much higher. Our egg breakfast at the hotel was decent and we met our tuk-tuk driver, Mr. Phet, who would be taking us around for the day. We made a quick stop at the town’s only ATM, which almost made me a millionaire — the exchange rate here is 8,500 kips to $1USD. 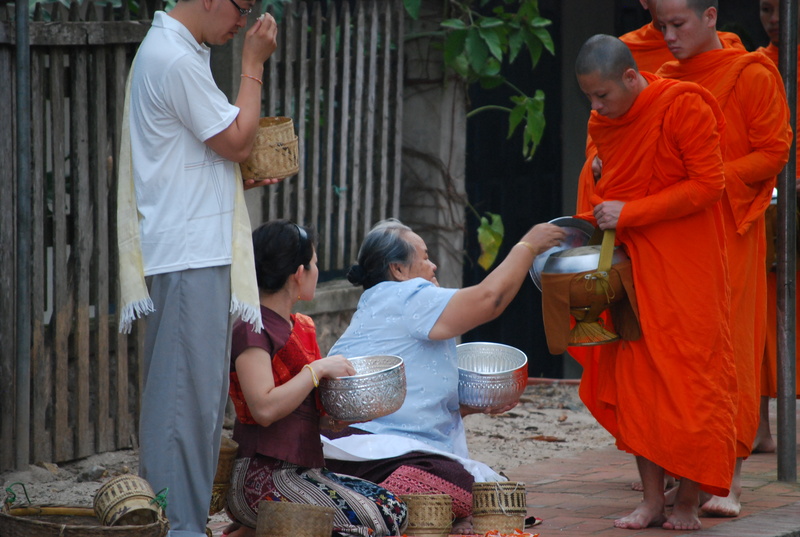 Afterwards, we were off to the Pak Ou Caves, about 25 kilometers away. 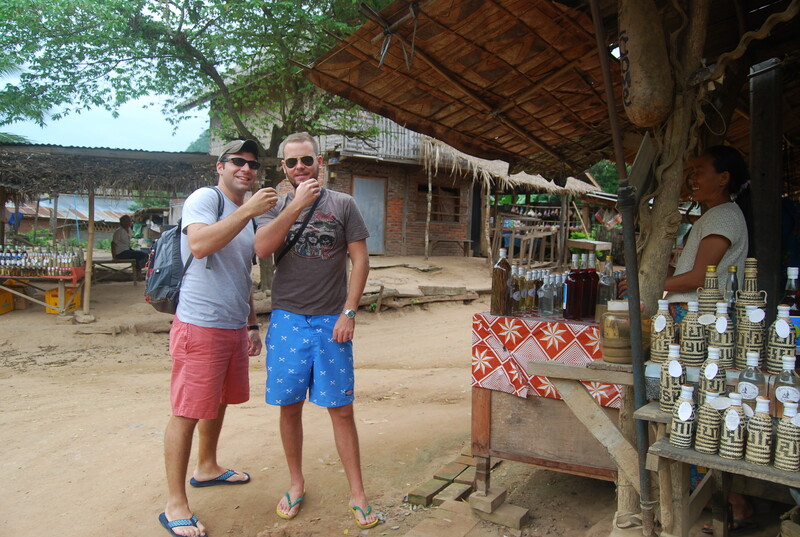 En route, Phet stopped at Son Hai, a small village known for its home-brewed hooch. 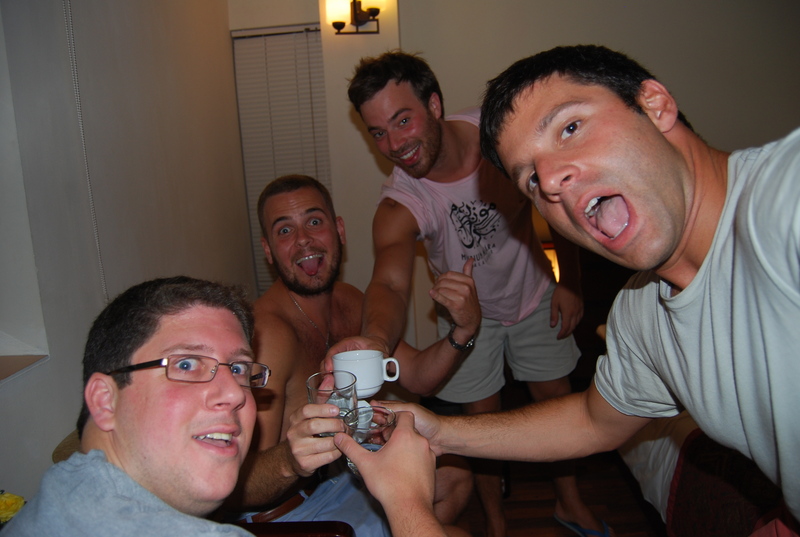 Although it was about 10 a.m., we couldn’t turn down a taste of Lao rice wine/whiskey — especially since it was 11 p.m. back home! It didn’t top Johnny Walker but it had a bite (50% alcohol) and we bought a small bottle for later consumption. 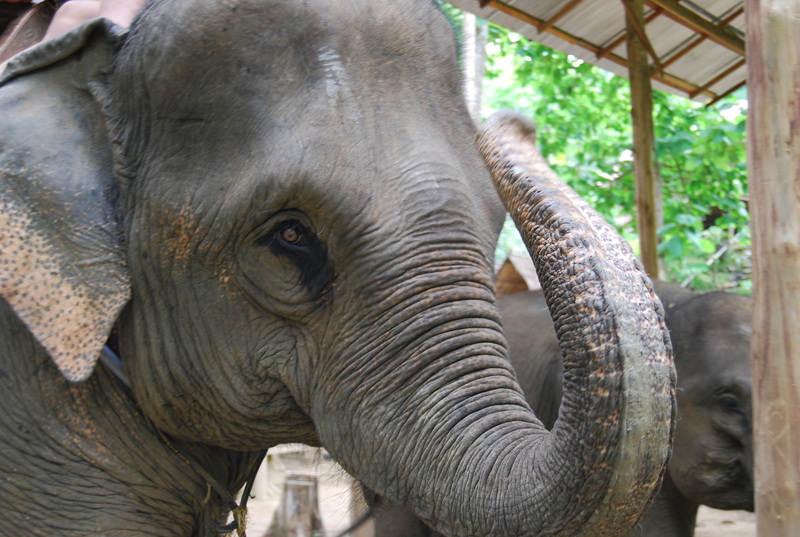 “We’re in the middle of nowhere right now,” Derek said as our tuk-tuk turned onto another dirt back-road. And he was right. I’ve traveled the world and have never felt this isolated while driving to the Pak Ou, two caves in the lower part of a limestone cliff. 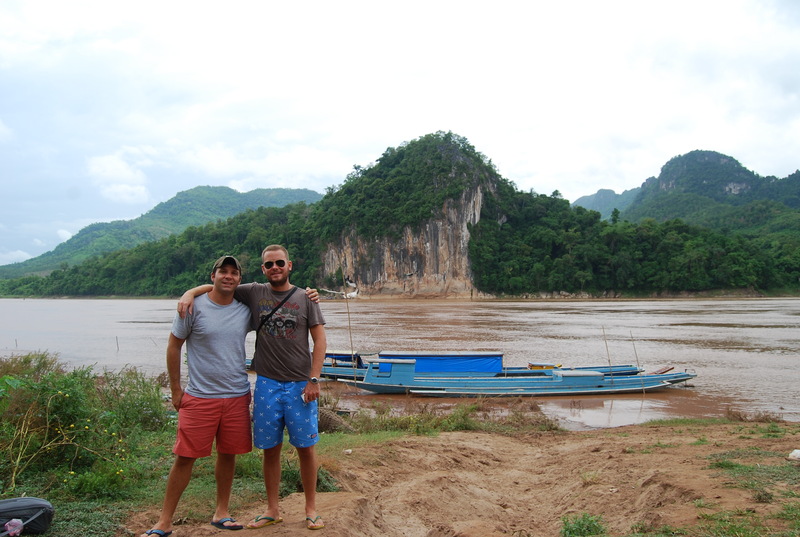 We snapped a photo before hiring a boat to take us across the Mekong. 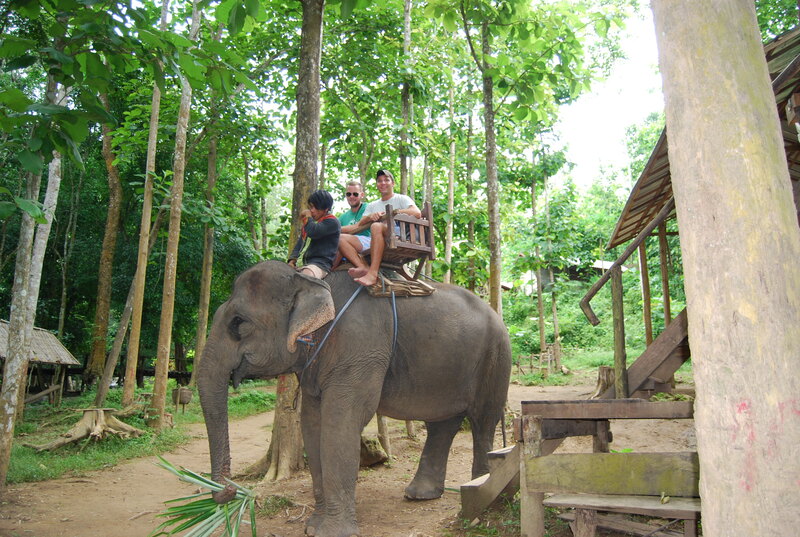 Our driver chugged a BeerLao, burped and we were off. 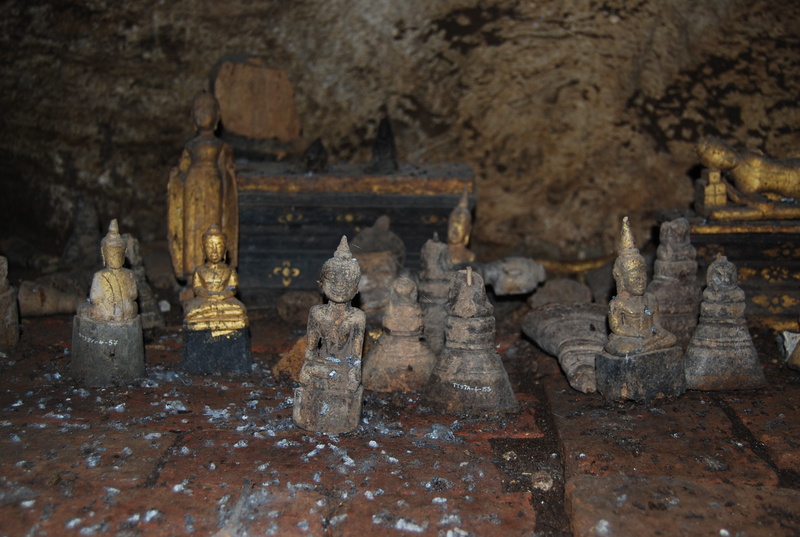 These caves are a religious shrine, where some 4,000 Buddha statues have come to die. They are big and small, some are wood, others metal, in various states of decay. 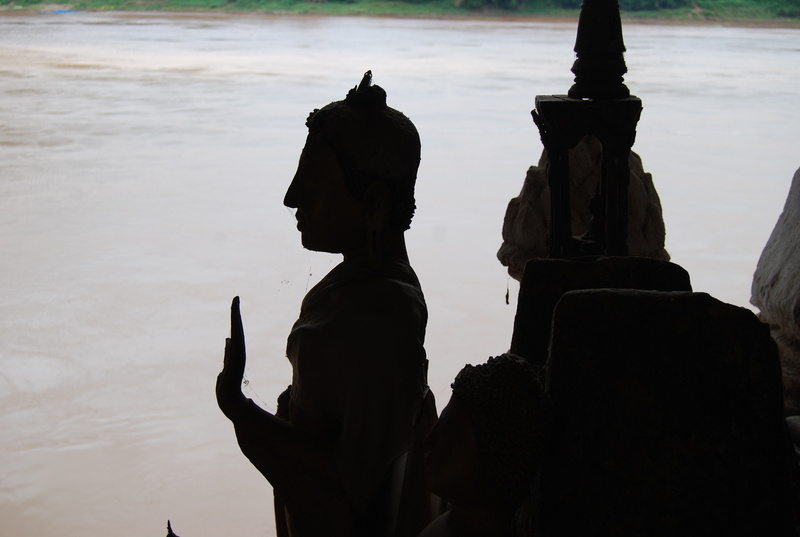 It’s a solemn and peaceful spot overlooking the Mekong. We hiked to the top cave and were assaulted by small children trying to sell us bananas, small birds in cages and crickets (no idea). 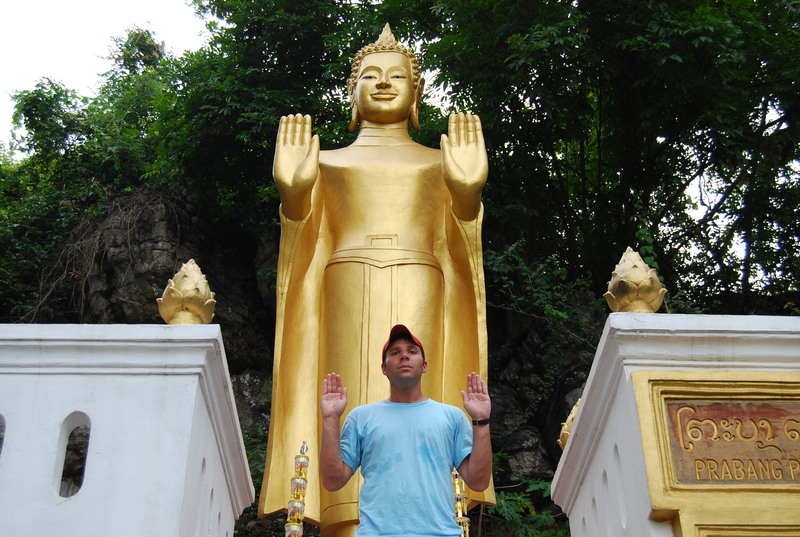 One hit Derek with a stick before we cautiously walked into the pitch-black ether to see some of the oldest Buddhas. On our way back onto the boat, a misstep almost landed me in the muddy Mekong. Luckily, the water only reached my knees and infection was kept at bay. 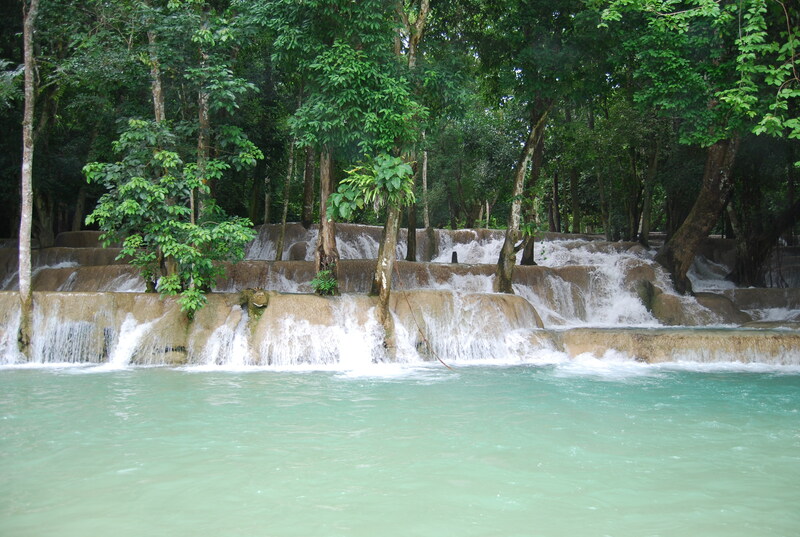 Phet drove us back to the hotel for some lunch, where we changed for our afternoon activity, Tat Kuang Si. 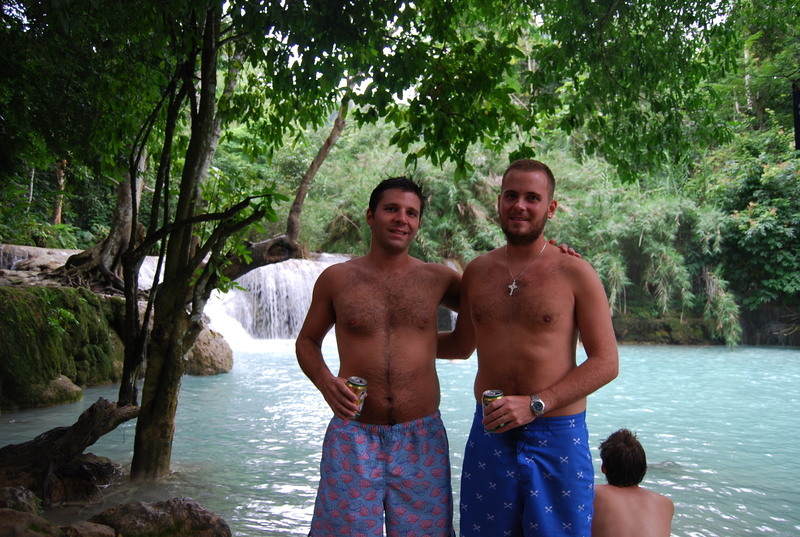 Located about 30 kilometers south of town, this is a many-tiered waterfall that flows over limestone cliffs into cool turquoise pools. Jumping in was actually quite cold, we haven’t felt this chilly outside of our air conditioning in weeks, if not months. Here is the obligatory Vineyard Vines promotional catalog shot. 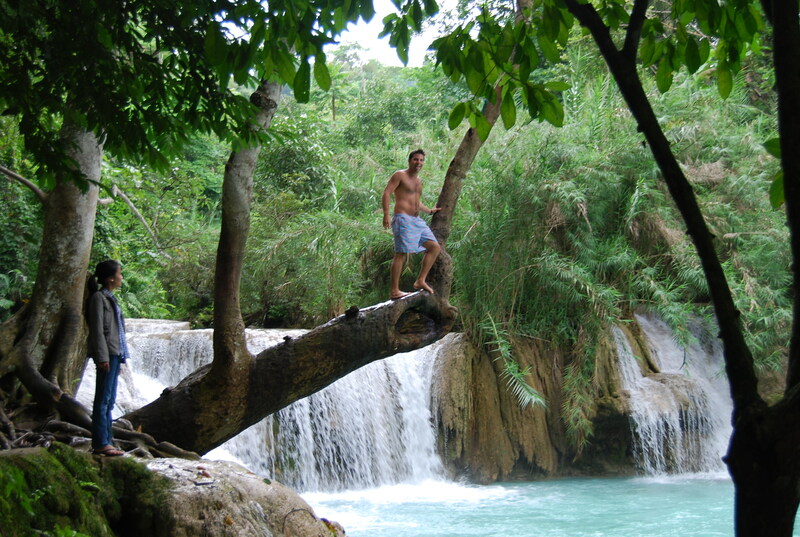 Afterwards, a Lao lady threw down a serious challenge for me to jump off a tree. Here’s to representing the U.S.A. Woot! 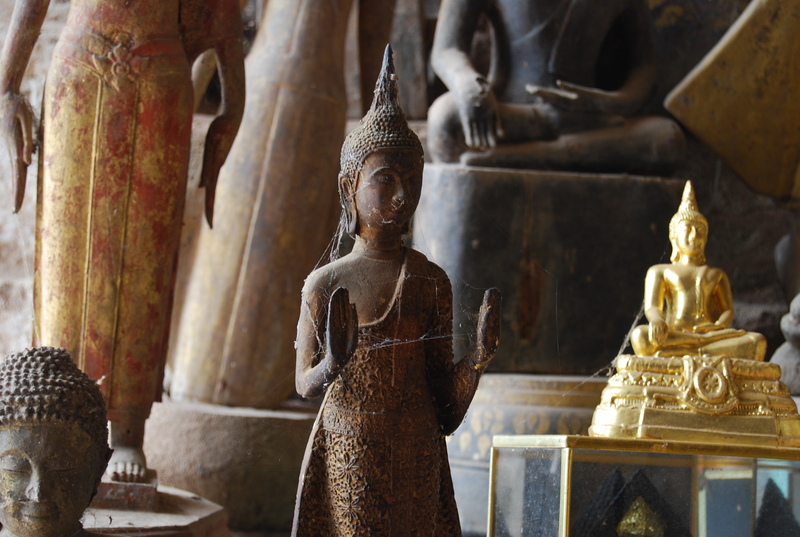 Our tuk-tuk returned us to the Apsara, where we rested up before dinner and hitting up the night market. Anticipating an early morning, we were tucked into bed shortly thereafter. It was a welcome sight to arrive at Siem Reap’s tiny airport this morning and see that our Vietnam Airlines flight to Laos would be aboard a jet, albeit a small one. Flying from deep in the jungle to deeper into the jungle, we feared a tiny propeller but instead got a Fokker 70 (whatever that is). The trip took about 90 minutes; for most of it, there was little to see besides mile after mile of thick foliage. 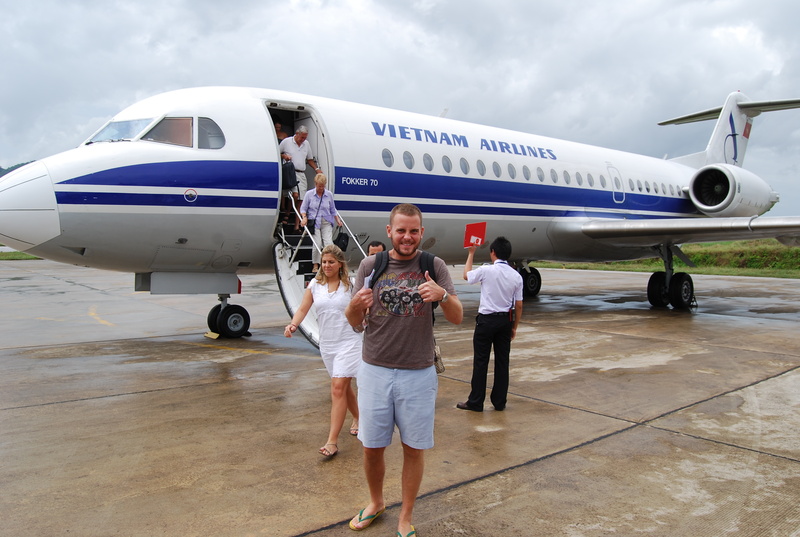 We touched down on Luang Prabang’s short runway at around 2:30 p.m. and realized, holy cow, we were in Laos! 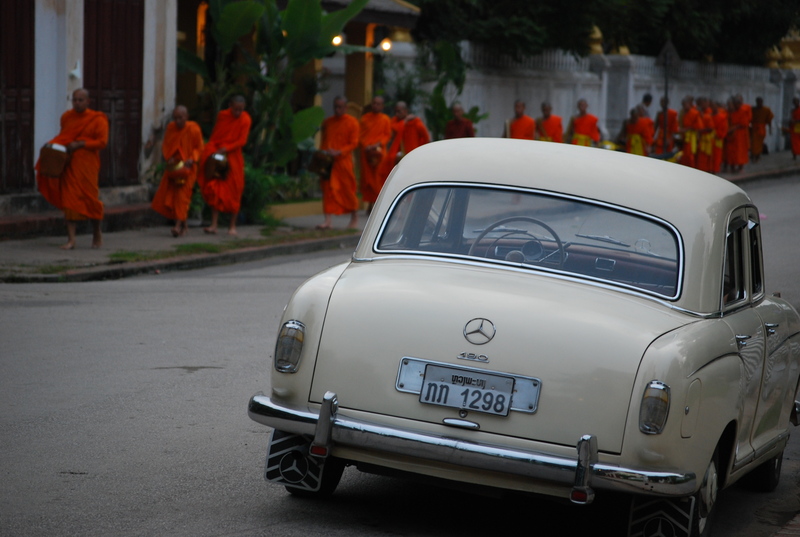 After buying a visa and collecting backpacks, our transfer was waiting to take us to the Apsara, what has been called Luang Prabang’s most chic hotel. It fits the bill, with an Asian décor, large and comfortable rooms and huge bathrooms. 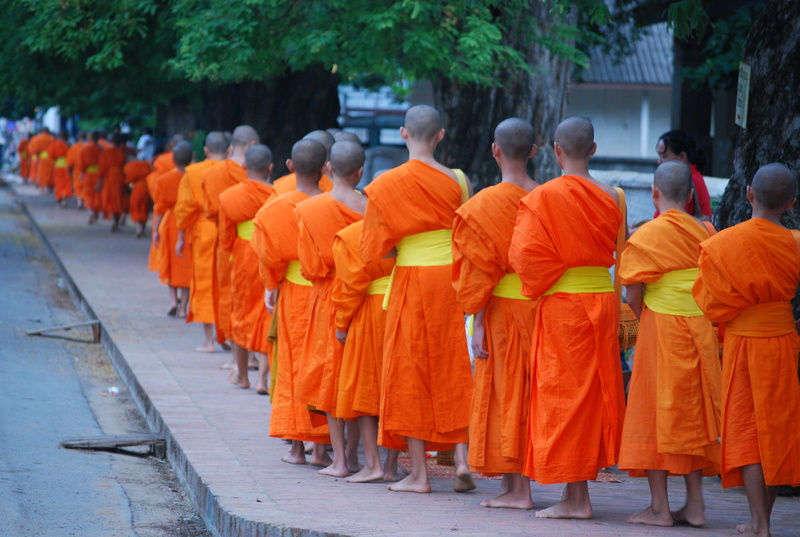 Walking to the town’s main drag, we passed monks in saffron robes and immediately felt the quiet and slow-paced way of life in Laos’ former capital. 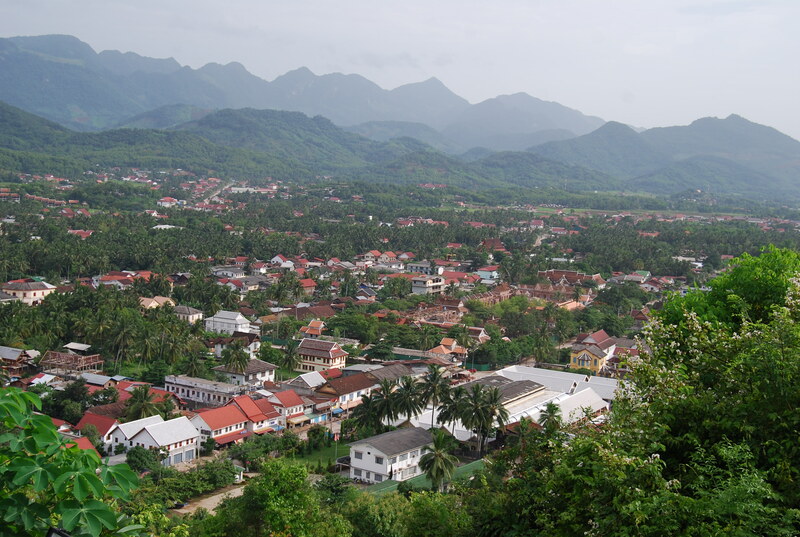 Luang Prabang is Unesco World Heritage listed, so trucks and buses are banned from the entire city; the multiethnic people here also lend to its relaxed pace. We popped into a French-owned café for sandwiches and ordered this nation’s acclaimed beverage, BeerLao (killer website). 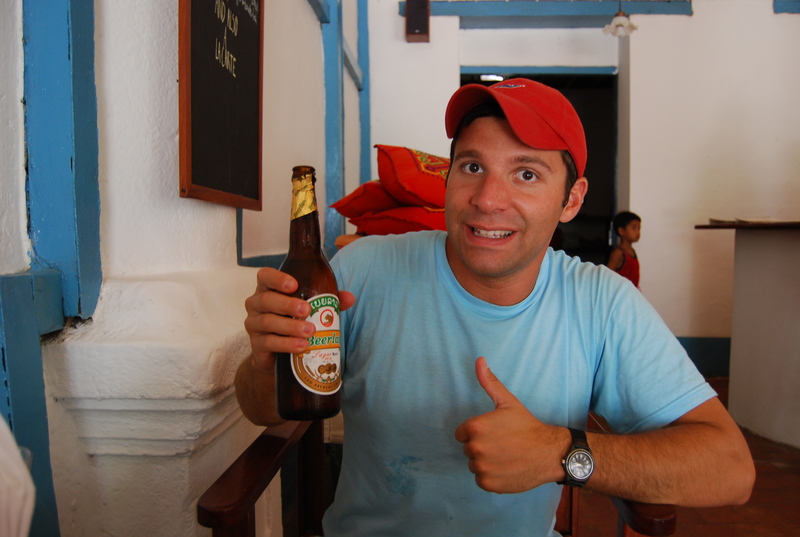 Most everyone I’ve told about coming to Laos has raved about this tonic, it is said to be the best beer in Southeast Asia. And you know what? We have a winner. With hopes that the Brickskeller would give me my BeerLao fix back home, we slowly climbed the slopes of Phu Si to visit the temples at its peak. 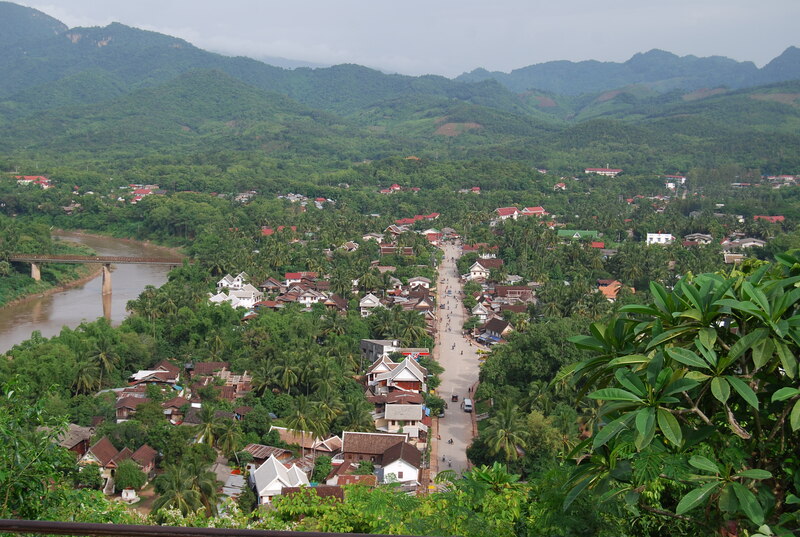 From there, we were afforded some great views of Luang Prabang, bordered on one side by the mighty Mekong River and on the other by a tributary, the Nam Khan. As could be expected, there were also some giant Buddhas, reclining Buddhas and Buddha footprints in the hill’s many shrines. Melting from the hike, we made our way back to the hotel to shower up and have some dinner. Luang Prabang isn’t known for its nightlife — in fact, there’s an 11:30 p.m. curfew — so we used the opportunity to catch up on some much needed sleep.